I have recently posted about Frederick Hudson and his wife Sarah Morris. The blog posts were transcriptions of the obituaries I found for them on my recent trip to Kansas. You can read them here: Frederick and Sarah. Both of the obituaries are the old school articles full of details and descriptive drama. I was able to locate these obituaries on my trip because of the research I did before visiting the Kansas State Archives. My process was to first look at my family tree to see who lived in Kansas and what information I have for them. Next I checked online databases and family trees to see if there was any additional information (or hints) available about these people. Once that was completed, I spent hours combing through the online catalog for the archives to make a list of microfilm to pull. I enjoyed the pre-research research. Not only did I identify holes in my research, I met a new cousin. 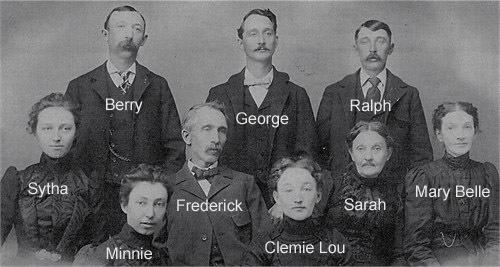 When searching for Frederick Hudson on www.ancestry.com, I found an online family tree that included a photo of the entire family!! I quickly emailed the owner of the tree. 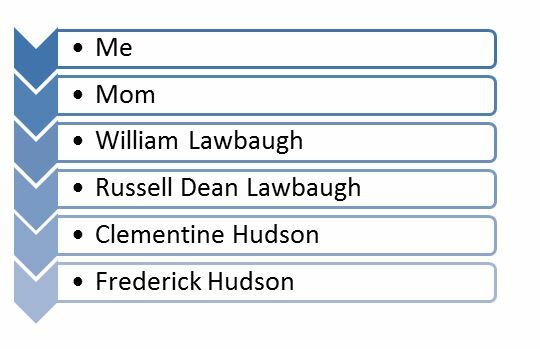 We have confirmed that we are third cousins with Frederick Hudson as our common ancestor. I asked and Carol gave me permission to download a copy of the family photo and use it on this website. 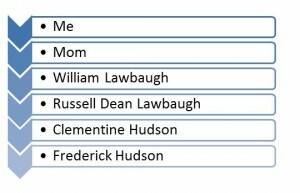 My direct line ancestors are Clemie Lou Hudson and her parents, Frederick Hudson and Sarah Jane Morris. The first copy is one I have altered to identify each family member. 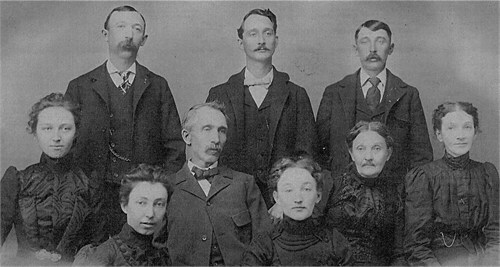 Back Row L to R, Berry Hudson, George Hudson, Ralph Hudson. Mary Belle Hudson Goodman Howard. Sarah Morris is my 3rd great-grandmother. She is another ancestor that I really do not know much about. I found her obituary at the Kansas State Archives on my trip to Kansas last month. I feel really lucky to have another great obituary in the paper to learn more about my ancestor. Along with a lot of personal information about Sarah, the obituary has great descriptions of the grief of the family. Another of La Cygne’s good mothers has passed from this world to her home in heaven. A family that she has tenderly cared for and nursed to manhood and womanhood is now deep in grief. The old home that has been one continued pleasure for more than a quarter of a century with a good mother presiding over it is now stilled in the sadness that death brings. Last Monday afternoon the spirit of Sarah J. wife of Frederick Hudson, departed this life and went to claim the reward in heaven that is promised to all good women. Mrs. Hudson had been in poor health for some time and while it really could be no surprise that the silver cord of life should sever at the ripe old age the deceased had attained, yet even with that possibility the friends and relatives were unprepared to meet the crisis. To take from the home the mother who has been its guardian for so many years is something that is hard to temper the heart to forego. Sarah J. Morris was born in Pike county, Illinois, August 6, 1835; she was married to Frederick Hudson December 30, 1855 and they removed to Kansas the winter of 1880 where they have resided ever since. In the sixteenth year of her life the deceased joined the Christian church and has been a worker for the Lord ever since. She leaves a husband, and seven children who are W.B. Hudson of Kansas City, Mrs. W.H. Lawbaugh of Wellington, Kansas, Mrs. F.H. Howard, Mrs. Chas. Moore, Mrs. L. H. Hetzer, and Ralph and George Hudson all of this place to mourn her death. Two brothers, Samuel Morris of Dallas, Texas and Geo. Morris of Pittsburgh, Kansas also survive. Funeral services were held at the family home in the south part of town on Wednesday morning at 10 o’clock by Elder R.A. Odenweller of Pleasanton. His remarks were very beautiful and he pictured the kind and loving woman who had fought life’s battles to the end and through it all maintained a sweet friendship for all. After the ceremony at the home the large concourse of grief stricken friends interred the body of the departed on in the Oak Lawn cemetery. Frederick Hudson is my 3rd great grand father on my maternal side. I found this obituary at the Kansas State Archives last weekend. I was so excited to find an obituary that offered so much information! Definitely another dancing at the microfilm reader moment. You know you are among friends when other researchers do not look at you funny but instead smile at your victory dance. My favorite part of the obituary is the description of the moments when Fred passed away. La Cygne is pronounced La Scene. Thank you to my Kansas cousins for teaching me this!! Fred Hudson died at his home in the south part of town Tuesday evening. He had been a resident of La Cygne since 1880 and had an active part in building the town. Bricklayer and plasterer by trade, soon after coming here he started a brick yard and began manufacturing brick. Most of the brick buildings in town are built with the Hudson brick. Because of failing health Mr. Hudson quit active work several years ago. Frederick Hudson was born in Scalford, Leicestershire, England, August 22, 1834, and died in La Cygne, Kan., May 22, 1923, at the age of 88 years and 9 months. When about nine years of age he came with his parents to America, making the voyage in a sail ship. Landing at New Orleans he traveled up the Mississippi River to Illinois, where he grew to manhood and worked with his father at the bricklaying and plastering trade which he followed so many years. He was married to Sarah G Morris at Milton, Ill., on December 30, 1855. To this union were born ten children, four of whom are still living and were with him when the end came. With his family he moved to La Cygne, January 1, 1880 and since the death of his wife, 19 years ago he has made his home with his son Ralph and family who have cared for him so devotedly, sparing no pains to make his life as pleasant as it was possible to do. Two or three years ago he suffered a stroke of paralysis but recovered sufficiently to be around most of the time, until last Friday morning when he had a serious attack and never fully regained consciousness. He made a confession of religion in his early manhood and later united with the Christian church at La Cygne during Rev. Irwin’s meetings several years ago and was one of the deacons of the church for some time, but owing to his age and failing health he had not been very active in church work in late years. He was an honest, upright citizen, honorable in all his dealings, a good neighbor, a devoted husband, a kind and loving father and a friend to those in need. He bore his sufferings patiently with never a murmur or complaint, and after a life of usefulness he passed peacefully away just as the sun was sinking to rest, and when the spirit was taking its flight he quietly laid his hands down as though he had finished his work and passed to his reward. His wife and two sons, W.B. and George H., and one daughter, Mrs. Belle Howard preceded him in death several years ago; also three children died in infancy. He leaves one son, Ralph, of La Cygne; three daughters, Mrs. Clem Lawbaugh of Wellington, Mrs. Minnie Hetzer and Mrs. Sytha Moore of Parker, eighteen grand children, eight great-grandchildren and a host of relatives and friends to mourn his loss. Funeral services were conducted by Rev. Boyer at the home of Mr. and Mrs. Ralph Hudson and the body was laid to rest in Oak LawnCemetery. Those from out of town for the funeral were: Mr. and Mrs. C.A. Moore and children and Mr. and Mrs. L.H. 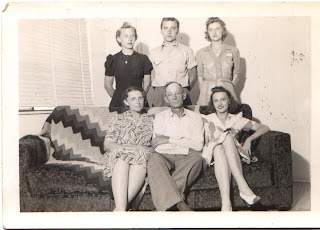 Hetzer of Parker; Mrs Clem Lawbaugh and son of Wellington; Mrs. Ida Hudson, Mrs, Irvin Wagner and Mrs. Hazel Smith of Kansas City; Fred Moore of Miami Station, Mo.